In search of what might be the gayest city in the world? Montréal holds a special place in North America because it’s the continent’s only major city where the majority of its population speaks French. Also named the “City of Design” by UNESCO, Montréal is part of a prestigious club known as the Creative Cities Network. Known for its impressive creative talent both on the cultural and artistic side, if you’re looking to see creativity at its full potential, you must visit Montréal. Now you’re thinking, well, that’s nice, but what makes Montréal so gay? There’s plenty to do in gay Montréal, including gay cinema, clubs, bars and restaurants. Montréal’s nightlife is second to none. The city celebrates Pride (not once, but twice) around August, and these events usually draw huge crowds. The city even has a metro station and street dedicated to the LGBTQ community. 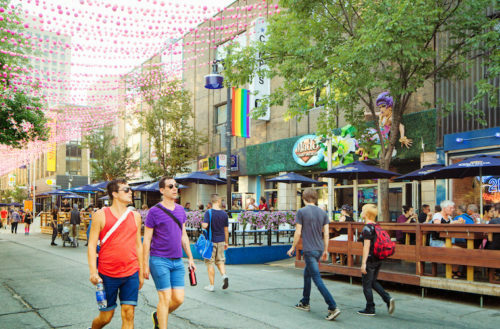 Saint-Catherine Street, the main street of gay Montréal, has a section decorated with colorful floating balls above head. 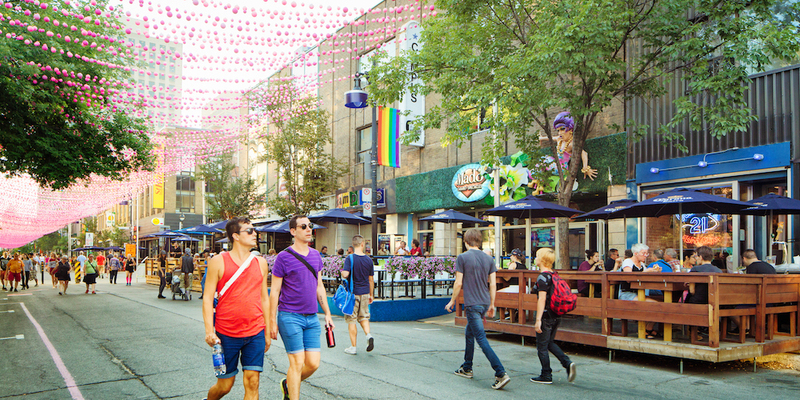 Known as Montréal’s Gay Village, this area is one of the most famous LGBTQ neighborhoods in the world. Yearly it welcomes thousands of LGBTQ and gay-friendly tourists from all over the world. The central section of Saint-Catherine Street becomes a pedestrian zone during the summer months. You can walk around and enjoy food and drink from different vendors under the famous Boubles Roses pink-ball canopy. The Village also hosts Aires Libres, a public art exhibition from May to September, one of the best opportunities in Montréal to experience culture and art. You’ll also want to check out the Beaudry metro station in the Gay Village. It was renovated and partially redecorated in 1999, and has a large new glassed-in entrance by architecture firm Béïque, Thuot and Legault. The rainbow-coloured masts over the door — an homage to the Gay Village, which the station serves — is a unique design to this station. Cabaret Mado is a cabaret venue exclusively for drag shows. This lively space draws a general audience with its nightly live performances. Mado Lamotte, the mother of the Montréal drag community, is the hostess and the main attraction here. Other local drag performers also entertain the crowds at this friendly spot. Stereo Club, established in 1998, is a great club in Montréal for enjoying diverse genres of music. The club’s mission is to create dance ecstasy for its music fans. It prides itself on spinning real underground and forward-thinking music. This after-hours club also knows how to throw great parties, bringing in carefully chosen artists with stellar visual presentations and lighting to entertain the crowd. Equally fun is the Unity Club, located in the heart of the Gay Village. It offers music lovers two different styles of music every night in its massive three-floor space. Unity also has a VIP lounge and a large terrace on its roof for parties. This place appeals to a diverse clientele that likes to hang out in a relaxed and unpretentious environment. The best place for white sangria? Complexe Sky, the biggest club in Montréal, has the best sangria in town. This place has four floors of different styles of music to enjoy, and a rooftop terrace with a pool and hot tub for relaxing. It also has two restaurants on the ground floor for fine dining. Complexe Sky creates a one-stop entertainment complex in Montréal for people to mingle and socialize. Black Eagle, L’Aigle Noir, is a favorite local bar that usually attracts a bear/leather crowd. Here you’ll mingle with locals and drink cheap beer in a pretention-free zone. Black Eagle also regularly hosts live music events to entertain its patrons. If you love to sing in front a crowd, Club Date is a great place to belt your heart out. Club Date is known for its casual environment, great drink selection, and fun karaoke nights. This bar provides an alternative place for guys (and girls) to hang out when clubbing isn’t your cup of tea. This year’s Montréal Pride marks the first time launching the inaugural edition of Canada Pride. A nationwide celebration of Canada’s LGBTQ movement, this 10-day festival takes place mid-August. In addition to the Montréal Pride parade and parties, this year the celebration will span 11 days, including two full weekends of activities. The program also includes a two-day sports tournament during the first weekend, as well as a major national conference on human rights. The Black & Blue Festival, another Montréal signature event, is a week-long festival taking place during the second week and weekend of October. Since 1991, this organization has raised money through its world-class events that attract people from all over the world. In addition to the main events like Leather Ball, Black & Blue Festival also sponsors different cultural, social and sports event for guys to meet and socialize. And it gets even better: This year Montréal is celebrating its 375th anniversary, making everything twice as exciting. The city expects an influx of tourists to help the city celebrate.